It’s sod season in Florida and I’ve been really busy at work. Of course, that means I haven’t had as much time to work on Emma as I’d like. This morning, I’m nursing a sore shoulder and decided to write the “Long Awaited Boat Report” rather than go to Miami for the day and wrestle four 60 pound batteries onto the boat and down below. I bought Emma, sight unseen, from Michigan. 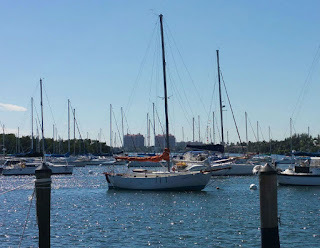 The Westsail 32 was exactly the boat that I wanted. I’d been looking at all types of heavy displacement, full keel boats, but what I really wanted was a Westsail. I found Emma on the Miami Craigslist, through the Westsail group on Facebook. That story is here. For $6000, I was really just buying the hull. 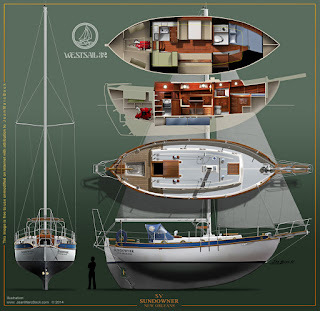 Having worked on Eleanor, a Westsail 42, I knew the quality of construction and the seakindliness of the Westsails. Anything else that was in good working order, beyond the ‘bulletproof’ hull, was gravy. I admit to having the rose-colored glasses of a dreamer. The interior was a little rougher than I had dreamed up, but there are no heartaches. There is nothing that some sweat equity won’t fix. Two previous owners back had painted the interior a stange green color. I imagine he found a good deal on some paint that happened to be green. It’s not bad, it’s just not for me. The most recent previous owner was painting some of the interior panels white. 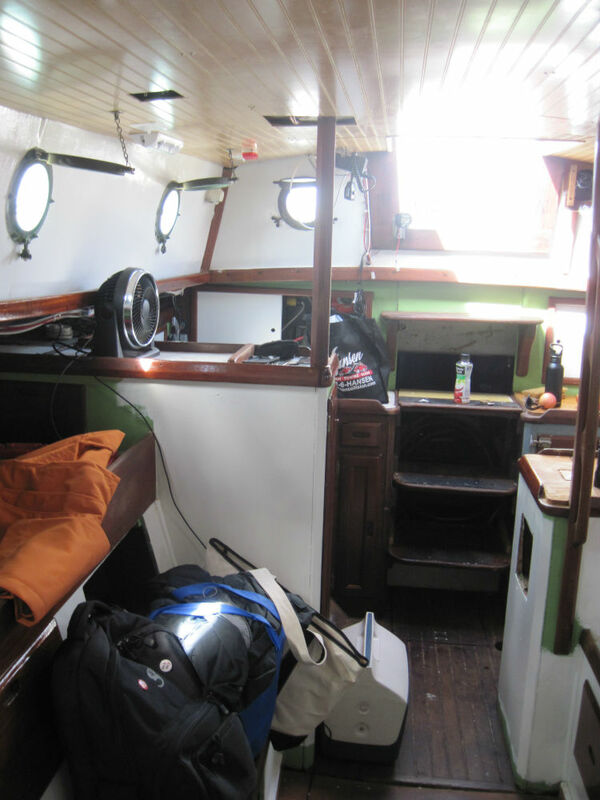 White panels with dark-stained trim is a classic Herreshoff interior and looks good on an old school boat like Emma. The original planked floor is just below the companionway steps. The rest of the interior floor has been replaced with plywood. 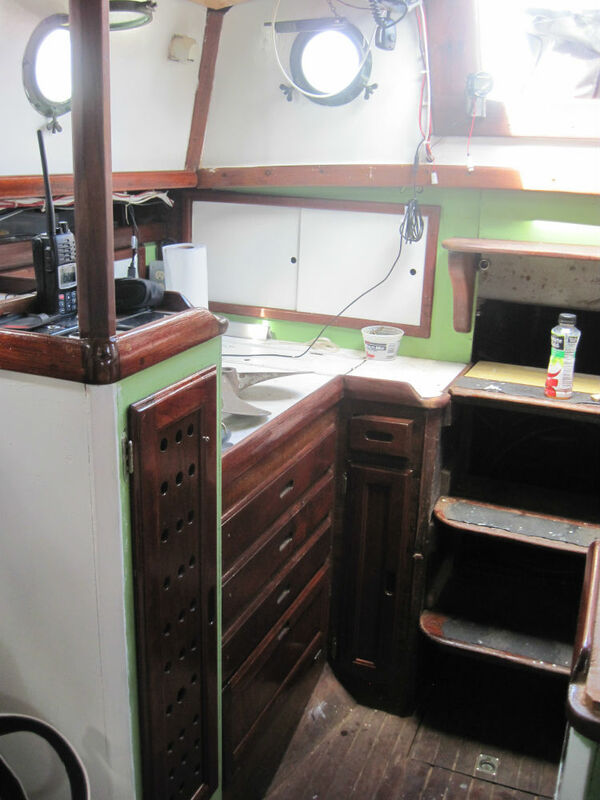 It’s in good shape, and is stained, but I would like more and easier access to the bilges. I’ll work on that. The interior layout is the standard Westsail 32 layout. 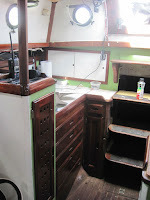 Down the companionway, the navigation station is to starboard with a U-shaped galley to port. A very interesting galvanized plumbing sculpture now occupies the counter. I think they must have been using a pail as a sink and needed the height to accommodate. There is no stove, but a good space for installing a good gimbaled stove/oven. I can’t wait to smell fresh baked bread aboard. 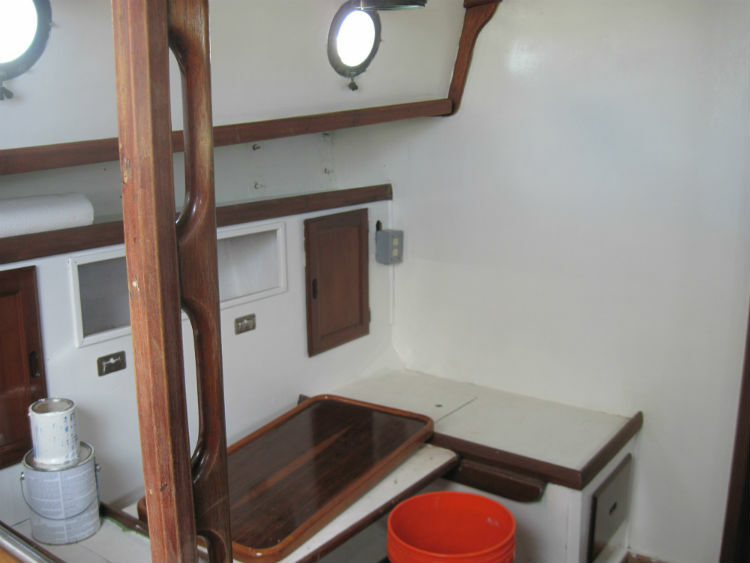 Forward of the galley and nav station is a dinette to port and two berths to starboard. The bottom bunk slides out to a full single. Above that is a pilot berth. I need to find or construct a dinette table. 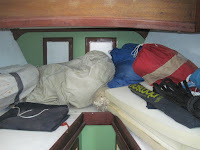 The dinette also becomes a double berth when folded down. There are no cushions, so I’ll be hunting up foam to shape and upholster. Next going forward is the head where I have installed a composting head to port as discussed here. 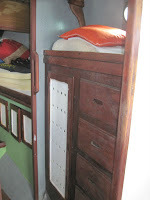 Across from the head is a nice built in cabinet to starboard. With a little clean up and stain, all the woodwork is going to be great! The Westsail is a large boat. On most boats, the V berth is crammed into the bow and sleeps two, one on each side with their feet converging in the small space toward the anchor locker. 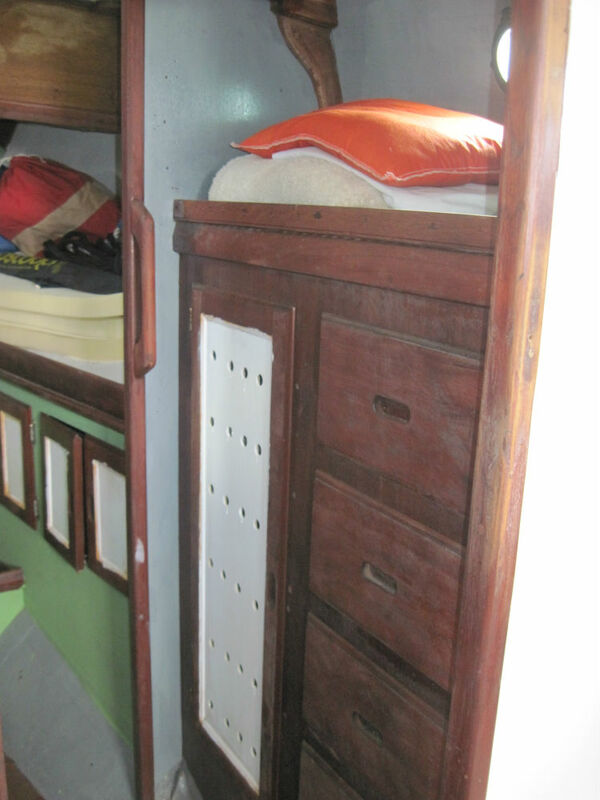 Emma is large enough that the V berth has a double bunk to port with a single to starboard. And more woodwork. The batteries were basically killed by neglect. The four batteries, three different types, were dead enough that I bought new batteries. As mentioned above, I bought four 6V 225 Ah golf cart batteries for my battery bank. The wiring needs some attention as well. There is some Romex house wire to tear out and the battery switch and breaker panel need to be properly used. The sails are in decent shape. 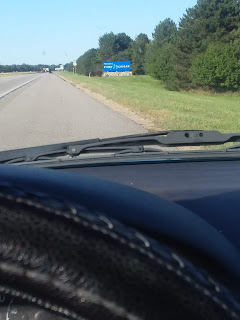 Good enough to get me to Fort Pierce. I’d really like to make a set of tan bark sails for her. 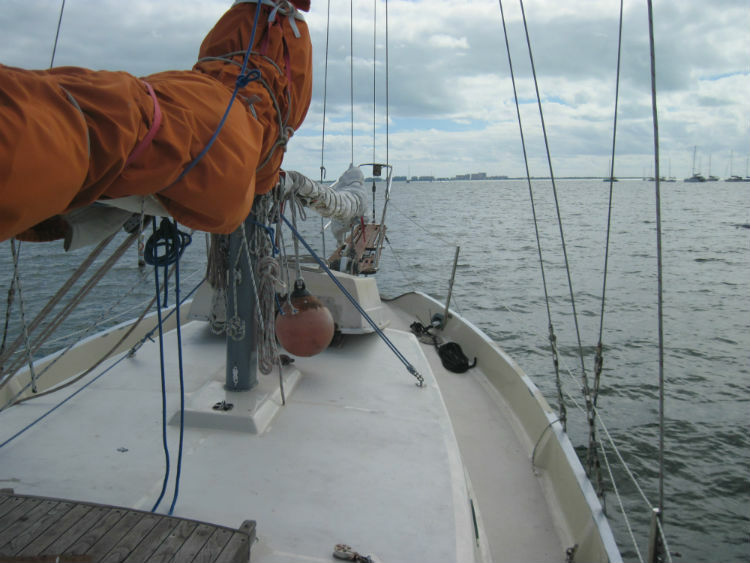 Emma is a cutter, so she has two headsails and a main. 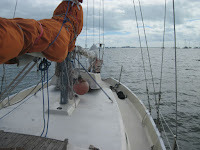 The effect is to spread the sail area over more, and smaller, sails which makes for easier handling. Still the genoa is a really big sail! I’ve always been a hank on guy, but might have to consider roller furling to safely handle that big sail. The standing rigging was done recently and has mechanical fittings rather than swage. It appears to be in good shape. The chainplates are stained a bit with rust. I'll take them off to inspect and will probably replace them. The running rigging is OK, but will be replaced during the refit. With the mast down, I will thoroughly inspect all the fittings. 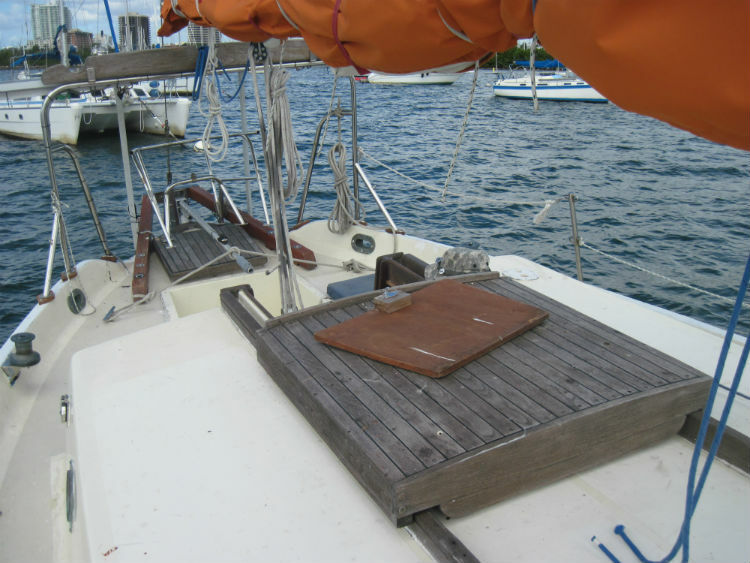 Further, using the "Things That Break" section of Bud Taplin's Repair Manual, I'll carefully inspect the bowsprit and boomkin fittings. Further, Emma has no engine. The good news is that there is no old engine to take out before I can install a new one. Repowering is one of the main projects to accomplish while she is out of the water. Above deck, she is a big, beautiful, old school lady. A bowsprit graces her bow and a cute little boomkin on the stern. These have been replaced and modified. I will purchase the stainless steel versions available from the Worldcruiser Yacht Company. Lastly, there is at least six months worth of growth on her bottom. 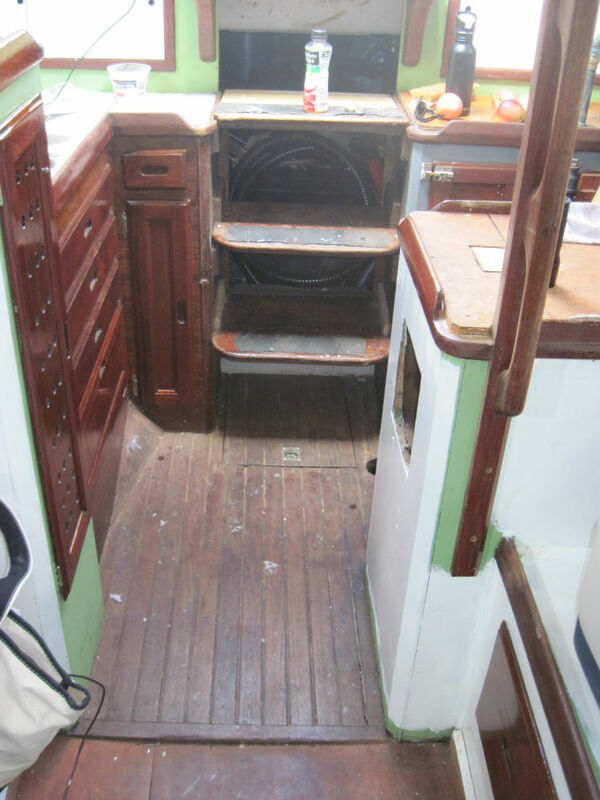 I’m hiring a professional scuba boat cleaner to do the first hull cleaning. 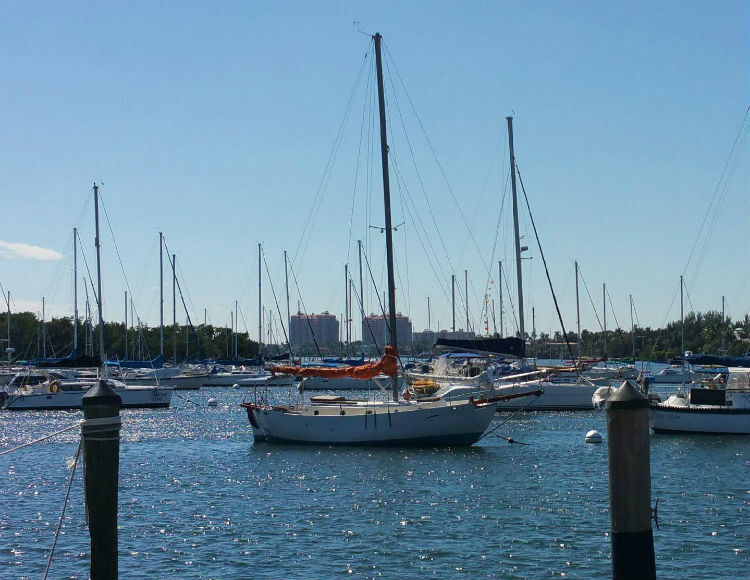 Once I get the electrical system straight enough to have running lights and a radio, and get the bottom cleaned, I’ll move her to Riverside Marina here in Fort Pierce. Hopefully, I’ll have her there in early May or sooner. Pretty boat. I know it'll be easier to give her the love she needs once she's closer by.